A Christmassy giveaway from Howards Motor Group! A VERY MERRY CHRISTMAS COMPETITION FROM HOWARDS MOTOR GROUP! ‘Tis the season to be jolly! So, we’ve decided to give away ANOTHER great prize just in time for the festive season! 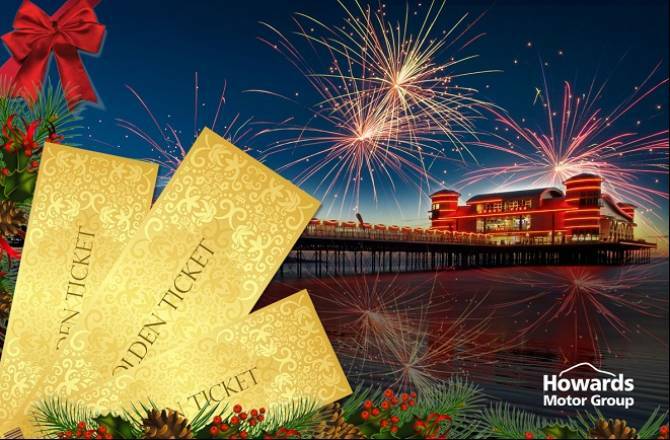 This time we will be giving away three tickets to the Fireworks at Sea on the 28th of December! This is set to be a spectacular fireworks display set over the beautiful backdrop of Weston-super-Mare! The tickets will give you access to the best views of the event, from the Grand Pier in Weston-super-Mare itself! We are giving away three GOLDEN tickets! These not only include the best views of the night and unlimited ride access but also a hot meal from the Boardwalk Cafe! Spoil yourself this festive season!